Welcome to Online Reasoning Test in AffairsCloud.com. We are starting Cumulus Course for IBPS RRB Clerk 2018 Main Exam and we are creating sample questions in Reasoning section, this type of Question will be asked in IBPS RRB Clerk 2018!!! Directions(Q.1 – 5) Study the following information carefully to answer the given questions. Seven persons – A, B, C, D, E, F and G – went to Symposium in the months of February, March, April May, July, October and December but not necessarily in the same order. 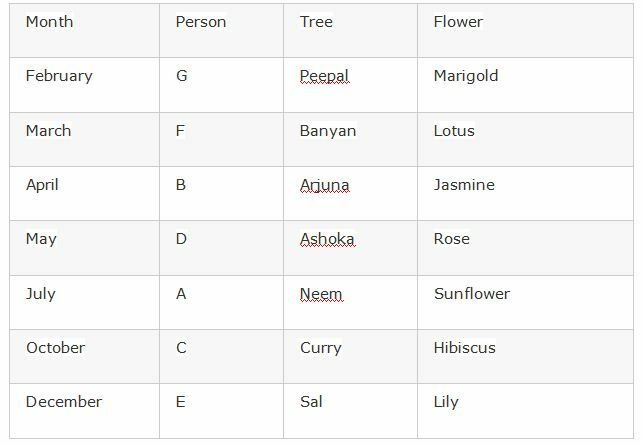 Each one of them likes different trees namely viz., Neem, Banyan, Ashoka, Sal, Arjuna, Peepal and Curry but not necessarily in the same order. Each person also likes seven different flowers namely viz – Jasmine, Rose, Lily, Marigold, Lotus, Sunflower and Hibiscus. The person who likes Jasmine went to Symposium on one of the months after March which has less than 31 days. The one who likes Arjuna went to Symposium in the month having less than 31 days. There are two persons went to Symposium between the one who likes Jasmine and the one who likes Hibiscus. E does not like Ashoka. The person who likes Peepal went to Symposium in the month having less than 31 days. There is only one person between A and the person who likes Arjuna. The person who likes Hibiscus went to Symposium immediately before the one who likes Lily. G went to Symposium in that month which has less than 31 days. The one who likes Ashoka went to Symposium immediately before A. C went to Symposium immediately after A. Only two persons went to Symposium between C and B. F went to Symposium immediately after G. Only one person went to Symposium between A and the who likes Sal. F does not like Marigold. A does not like Peepal. The one who likes Neem went to Symposium immediately before the one who likes Curry. The person who likes Rose went to Symposium immediately before the one who likes Sunflower and immediately after the one who likes Jasmine. Which of the following trees is liked by C? Which of the following combinations of Month-Person-tree-flower is correct? Which of the following statements is true with respect to the given arrangement? D went to Symposium immediately before E.
Who among the following went to Symposium in May? Who among the following likes Sunflower? Directions(Q.6 – 10) Study the following information carefully to answer the given questions. 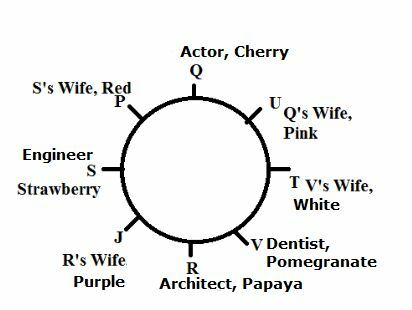 J, P, Q, R, S, T, U and V are four married couples sitting in a circle facing the center. The professions of the males within the group are Actor, Architect, Engineer and Dentist. Each man likes different fruits namely viz, Strawberry, Pomegranate, Papaya and Cherry. Each woman likes different colours namely viz, Pink, White, Purple and Red. Among the males, R, the Architect and V, the Dentist are sitting together. R is not the Dentist. The Architect’s wife sits immediate right to the Engineer and Each man is seated beside his wife. U, the wife of the Actor is seated second to the right of V. T is seated between U and V. P is the wife of the Engineer. Q is not the Engineer. S is a male. The one who likes Pink and the one who likes White are immediate neighbours of each other. The one who likes Pomegranate and the one who likes Papaya are immediate neighbours of each other. There are two persons sit between the one who likes Pomegranate and Cherry. Only one sits between the one who likes Strawberry and Papaya. J does not like Red. The wives of which two husbands are immediate neighbors? Four of the following are alike in a certain way based on their seating position in the above arrangement and so form a group. Which is the one that does not belong to the true? What is the position of J with respect to the one who likes Pink? Who among the following likes Strawberry?